Here at UK Poker News, along with our colleagues at the other Poker News locations around the globe, we like to keep our eyes peeled for the latest trends in online poker. One phenomenon which has struck home in recent months is the popularity in Europe of Everest Poker. 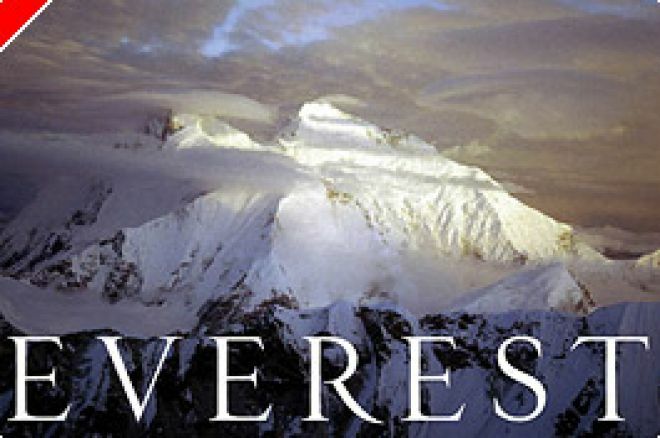 The Continental Europeans in particular are signing up to Everest Poker in far greater numbers than any other site, even the more well-known ones, through Poker News. This has to be for a good reason and it's certainly excellent news for players knowing that they are guaranteed a growing choice of tables and players from across the European expanse. You will find the Scandinavians here, wielding their usual aggressiveness at the no limit tables - all you need do is avoid the good ones! Then there are the southern European players who often like to gamble with you, the flair of the French, the solid play from the Germans and the Marcel Luske plays by the Dutch, plus plenty of British and Irish competing with the best of them. Most of all there is the value! We logged on to see what was happening. In the Multi-Table Tournaments section, there were regular guaranteed prize pool events going on, hourly and more, and they all showed large overlays. For example, the next one up was a $10 MTT with a $2,000 guaranteed prize pool. This meant that players would be getting money added by Everest Poker if the numbers entering the event were less than 200. With 15 minutes to go, only 66 had signed up! By the close of registration, still only 154 had entered. Therefore the players had contributed $1,540 of the prize pool while Everest Poker added $460, effectively a gift to the players! The following event, one hour later, was a $5 MTT with $1,500 guaranteed so you would expect to see larger numbers of players with such a small entry fee. Everest were paying out the equivalent of 300 buy-ins, while in fact 253 entered before registration closed. Another $235 added by Everest! Fantastic value! Apart from cash tournaments, there are satellites into the biggest live events in the world. Next in line are qualifiers to the Scandinavian leg of the European Poker Tour and the Five Diamond Classic on the World poker Tour in Las Vegas. Signing up to Everest Poker is easy and there are two bonuses ready and waiting. Everest will credit a $100 match deposit bonus plus we at Poker News will ensure you have a further $50 to play for when you deposit using the code PNEWS1. It could not be easier to play at Everest Poker! Every time you leave the tables, a portion of your bonus is credited instantly for you to play with next time you sit down. In addition you receive "Summit Points" and these can be used to enter tournaments too. At the moment, there is also a special Summit Points $7,500 Freeroll waiting to be played. This is a limit hold'em Free tournament with a $7,500 prize pool. To enter you simply have to finish in the top 300 places in the Summit Point Limit Leaderboard. Now is the time to enter as it runs throughout November. In addition to tournaments, you will find Texas Hold'em cash games, Free Play tables for beginners and a section of tournaments paid for by "Summit Points". The Everest Poker room is powered by the well-respected Grand Virtual software platform. The Grand Virtual Multi-Player Poker software features an intuitive lobby with a convenient "find-a-seat" wizard, realistic 3D poker tables with player-selectable avatars, an exclusive automated training room, a step-by-step interactive poker tutorial, and native translation of all product interfaces, controls and messages in over a dozen languages. So wherever you are in Europe, you can play to suit your needs. Everest Poker has never allowed US players to participate so has not suffered any loss of players in the recent changes in the law over there. As always in times of change, there will emerge a new order that adapts better than most to the changes. Judging by the popularity to join Everest that we have seen at Poker News in Europe, the value is clearly worthwhile signing up for!